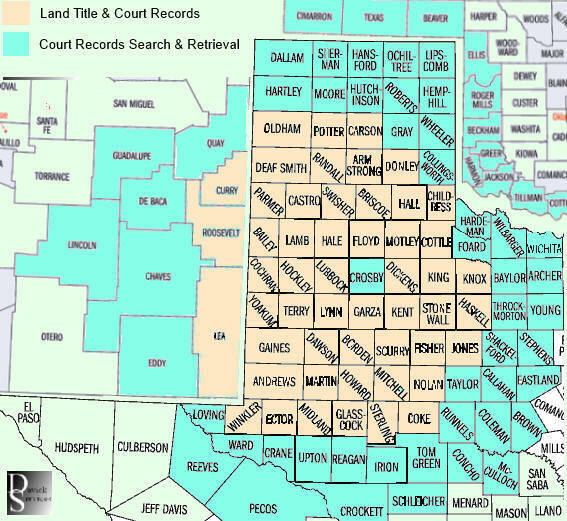 Lenders, law firms, registered agents and investors across the country look to Davick Services to search and retrieve records in 118 rural counties in Texas, New Mexico, Oklahoma and Kansas. Our searchers provide quick, accurate and comprehensive due diligence, risk management and title services direct from the courthouse to help organizations make informed business decisions. Often required by attorneys, investigators and UCC specialists, court record searches are a type of due diligence search of public records filed at the state and county level. These searches are by individual or company name and typically cover a ten-year period you specify. A professional court record search will reveal civil lawsuits, divorce, child support liens, criminal records, involuntary liens, judgments, federal tax liens, state tax liens, UCC and Fixture Filings. Each search is completed at the courthouse by one of our professional searchers or abstractors who travels to the jurisdiction to conduct a hands-on inspection and document retrieval of the official public records. Davick Services does not use outside abstractors, researchers or unreliable online searches. Only a professional who physically visits the courthouse can provide the level of due diligence our clients expect. Our searches are backed by $1,000,000 in errors and omissions insurance..